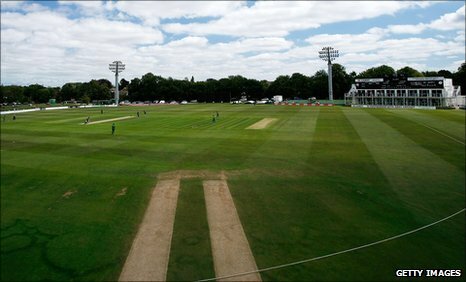 Kent chief executive Jamie Clifford has said he has received a mixed response to the county staging the first day-night County Championship match. The game against Glamorgan, starting on Monday, will be played each day between 1400 and 2100 BST under floodlights with a high visibility pink ball. "I've had e-mails from those who find it a disappointing deviation," Clifford told BBC Radio Kent. "I've had just as many saying 'I work nine to five and it's a lovely treat'." Both Kent and Glamorgan accepted an offer from the England and Wales Cricket Board to experiment with the pink ball in a floodlit first-class game as it is understood the governing body were keen to choose a match without any silverware, promotion or relegation issues resting on it. A pink ball has already been trialled in first-class cricket in Pakistan and in the traditional season curtain-raiser between the county champions and the MCC in Abu Dhabi for the past two years. The move is part of an International Cricket Council proposal to introduced day-night Test matches. Clifford added: "It may be the start of something very special, it may be a one-off and something the game decides never to do again. "I hope our members understand why we are doing it. We've gone through decades of the game being played in a traditional way. They have to explore ways of making the game as multi-dimensional as possible. "This aids the understanding of another different way of staging a County Championship match, accepting that it is a change from over a century of the way in which it's been run." Kent coach Paul Farbrace pointed out that the last major experiment in county cricket was now a fundamental part of the game. "When Twenty20 started people said 'it's all a load of rubbish' and 'it's just pub cricket played by professionals'. Now it's the life blood of cricket and it's played all over the world," he said. "If in 10 years' time there is floodlit cricket played over four or five days and far more people are watching the game, we can look back and say we played a major part of that at Kent Cricket Club."